Lobster. Bacon. Cheese. Bechamel sauce. Any one of these additives would be enough to make a rich mac 'n cheese. Two or three of these ingredients in the same dish? Now you're just showing off. All four of these ingredients together? That's the sort of decadence that gets dictators overthrown. Sublime Food Lounge, which opened about seven months ago in the old Wilson space in Culver City, makes a mac 'n cheese with all the titular ingredients. With so much sumptuousness competing for the palate's attention, could a lobster bacon mac 'n cheese possibly be any good? 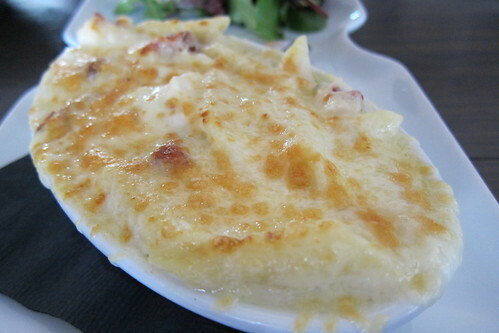 Sublime is generous with all their ingredients, especially the bechamel and the thick chunks of smoky bacon. The lobster flavor is subtle but pervasive and really pops when you happen upon a bit of claw meat. My general disdain for mixing seafood and cheese was allayed. The cheese crust adds saltiness and the chewy top-layer I adore in a baked mac 'n cheese. 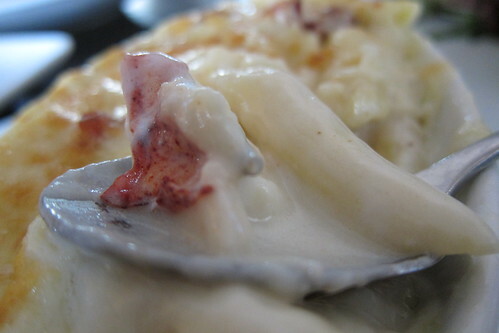 If anything, Sublime's mac 'n cheese felt old school, kind of like Lobster Thermidor. There's a dish you rarely see nowadays, but at one time in America, it represented the epitome of continental haute cuisine. These days, mac 'n cheese itself has gone gourmet, representing a new, more modern ideal of haute cuisine. DISH: Lobster bacon mac 'n cheese ($14).